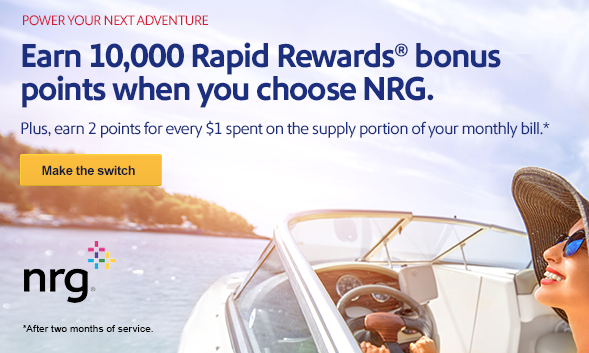 Southwest Airlines and NRG, an electricity and natural gas supplier in select U.S. states, have teamed to offer 10,000 Southwest Rapid Rewards points to Rapid Rewards members who choose NRG as their home utility supplier. If you’re a Chase Southwest Rapid Rewards credit card holder, you’ll earn an additional 2,500 points, making your total sign-up bonus 12,500 Rapid Rewards points. Once you’re an NRG customer, you’ll continue to earn points on the supply portion of your monthly utility bill, adding even more to your stash of Rapid Rewards points. NRG is a natural gas and electricity supplier in Illinois, Maryland, Massachusetts, New Jersey, Ohio and Pennsylvania. Only residents of those states are able to take advantage of this Southwest Airlines/NRG promotion. After 2-months as an NRG natural gas and/or electric customer, 10,000 Southwest Rapid Rewards points will be deposited into your account (12,500 if you’re a Chase Southwest Airlines credit card holder). As an ongoing benefit, non-credit card holders will earn 2 Rapid Rewards points per $1 spent on the supply portion of the monthly utility bill, while Chase Southwest Rapid Rewards credit card holders will earn 3 Rapid Rewards points per $1 spent. You can select your state and read specifics of the deal at the link below. For those engaged in the Miles and Points hobby, credit card sign-up bonuses are the primary way to build valuable Miles and Points balances. Following closely behind credit card sign-ups are strategic use of credit card bonused spend categories and the myriad Miles and Points bonus deals that come along…this promotion being one. While 10,000 or 12,500 Rapid Rewards points in and of themselves won’t be enough for your next award ticket, they will definitely help get you there. I’ve taken advantage of similar Miles bonuses for switching to a certain utility provider and have enjoyed the boost to my airline miles balance as a result. One thing to be aware of, though, is that utility pricing for these Miles/Points promotions will likely be higher than other electric or natural gas options. For me, I would sign-up, get the bonus points, stay with the program until there was no longer a cancellation penalty, and move on to a lower priced utility option. How about you, will you take advantage of this Southwest Rapid Rewards promotion?